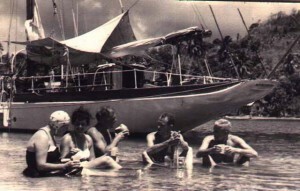 Nicholson Yacht Charter & Services – yachting’s history. How did it happen? Well, you see my father, the Commander, was in the Royal Navy and the family followed his appointments, when feasible, to be near him. In wartime, it was possible to rent unfurnished houses, but impossible to find furnished houses. So what did we do? 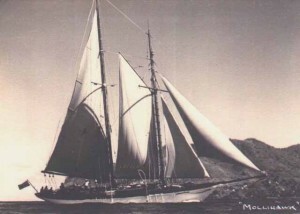 Well, we bought a yacht, cheap – a beautiful 70 ft schooner of 1903 vintage. We didn’t want the yacht, nobody did in wartime, but this lovely one, the Mollihawk, was lying in a mud berth on the Dart and she was FURNISHED! 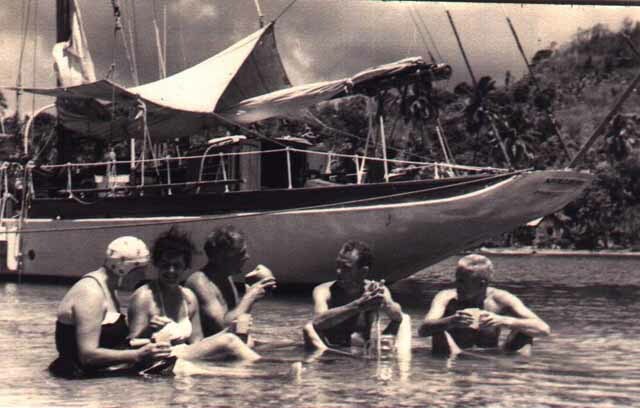 We bought the yacht just for the knives, forks and spoons, linen and blankets – all the things that were impossible to find, for one needed ration books to buy them in the shops if one could. So we bought the yacht to furnish a house near Plymouth, Devon, England. After the war, when we two lads came out of the services, the Commander had already started refitting Mollihawk with an idea of going back to the West Indies where he had once patrolled the islands during the war, just as Nelson once did. 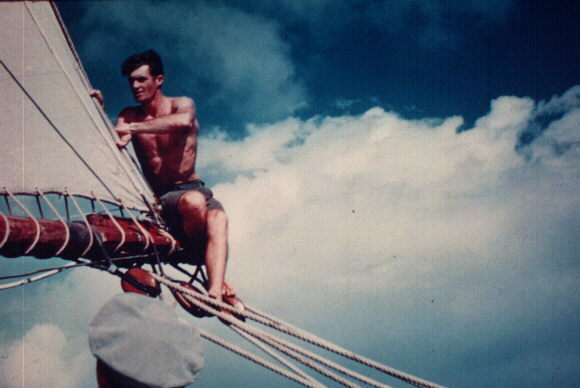 At the time, Dad was based in Bermuda and we had braved the Battle of the Atlantic to join him there. It was amongst those islands we learnt our first seamanship when going shopping across the Sound. 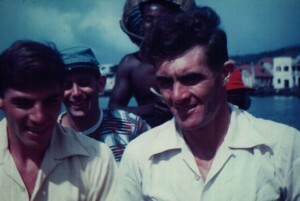 The Commander had always wanted to return to the West Indies because of the constant trade wind, saying it was possible to get to cocktail parties on time to any island! I said “Come on, Dad, you’re always talking and we never do anything”! That was it! We soon set sail from Cork, where we happened to be, and calling at Cascais, Gibraltar, Tangier, the Canaries, we arrived in Barbados seven weeks later on January 1, 1949. 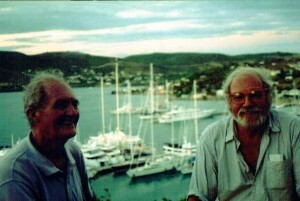 We then sailed up the islands to Antigua arriving at St. John’s on Feb 8th. Here we spent a month, my father interviewing big time businessmen hoping to find jobs for his sons. They were very pessimistic, as the sugar industry had started to run down, the workers beginning to realise they were being exploited too much. There was even a years series of strikes. So on March 9th at 4:30 pm we first came to alongside the inner wharf at the old 1745 Naval Dockyard, (Nelson’s Dockyard, English Harbour) little knowing we would be spending the rest of our lives there! The first thing we did was a big refit on the grassy deserted wharfs. Then we picked up shingles wind strewn over the dockyard to fix the roof of the old Commissioner’s Room & Paymaster’s House in which we squatted to make a shoreside home. The people were very poor and later at English Harbour Mrs. Nicholson gave bread to hungry children. 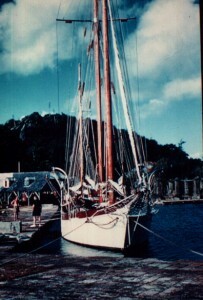 She became very popular and even to this day the Nicholson family are still thought well of in English Harbour. I suppose also because we had created a new industry for Antigua, thus creating new jobs after the demise of sugar. Well, that’s how it all started. From then on, charters snowballed. First Dad and one son went along and left the other to look after Mum in the Pay Office, then the day came when the sons went sailing alone. All the time we kept in touch on 2527 kz with a surplus American tank transceiver, with dials all marked in Russian, as they had been made to support “Aid for Russia” during the war. 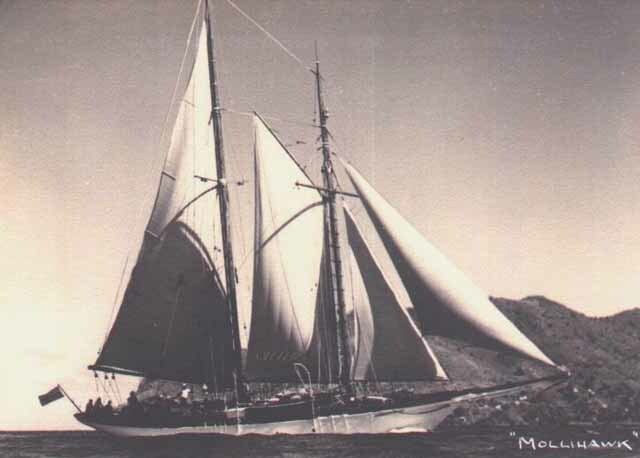 One day, a visiting American yachtsman left his yacht with us to operate, and an Englishman sent an air ticket for me to fetch the 84 ft schooner “Freelance” of 1908 vintage from the Mediterranean. My crew consisted of five girls and two men. So after arrival each of us had a yacht to go chartering on! 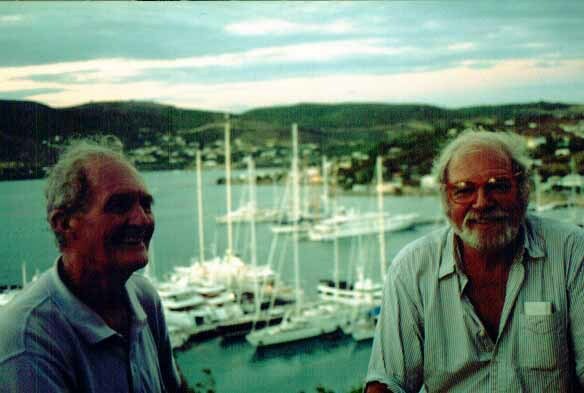 Voluntarily the Commander became the first restoration Supervisor for the Society of Friends of English Harbour, but contrary to legend, the Nicholsons did not restore English Harbour, they simply made it come alive – something that helped restoration. 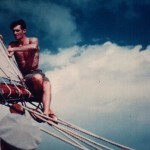 I swallowed the anchor after I married my charterer’s daughter (1957) and my brother Rodney, married (1956) Julie, a young lady off the brigantine (Irving Johnson’s) “Yankee” that had just circumnavigated. She’d been round the whole world and not seen a man like Rodney! And so we got spliced, settled down. 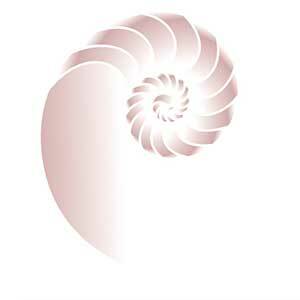 Here are some testimonials about Nicholson Yacht Charter & Services that you might find interesting.